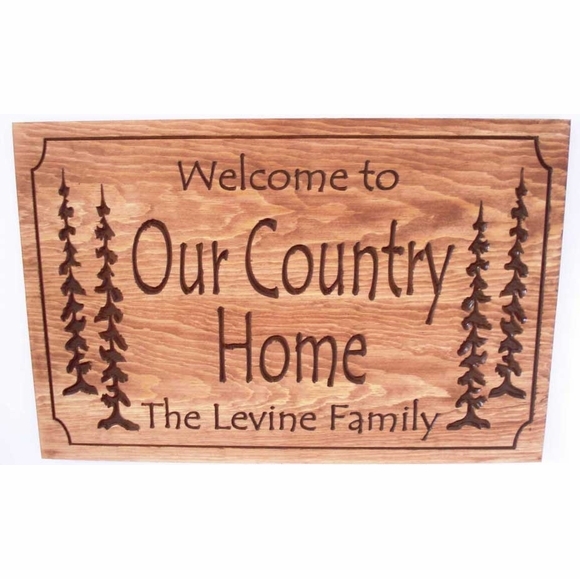 Welcome to Our Country Home Plaque - - with pine tree accents. Custom made cabin sign says Welcome and is personalized with your family name. Solid pine construction. free personalization. Made in USA. Cabin theme Welcome sign. Wall mount. Rustic brown finish with clear-coat marine-grade sealer. All the text and carved portions are painted medium brown. The overall wood grain is captured and highlighted with a variety of brown tones to create a rustic look. The highlighted wood grain varies from piece to piece, which means each sign is unique. Personalized with the name you supply and the edge style you select. "Welcome to Our Country Home" is standard on all signs. 18" x 7" sign: name line holds up to seventeen (17) 0.5" characters. 22" x 9" sign: name line holds up to twenty (20) 1" characters. 24" x 11" sign: name line holds up to twenty-four (24) 1" characters.